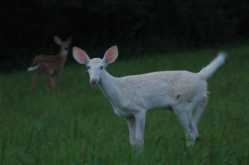 The white deer (with a sibling) that's been seen around Cape Girardeau. Craig, that is a great picture! Good to see you are still around Cape Girardeau.